Light shown on the AIDS Quilts and Prayer Rugs. It united us as pilgrims. We walked to Grace Cathedral and Fort Mason in San Francisco. We wove our lives together and let the light shine through us on an urban hike that became a pilgrimage. We climbed to the top of Nob Hill up hidden stairwells in the city. We then entered Grace Cathedral. The morning light streamed through the stained glass windows illuminating sections of the AIDS quilt. Colors, names, dates, and images lined the cathedral. We stood in silence and wonder as the memories of the AIDS epidemic washed through us. We wove our lives with the lives of those who had died from AIDS. We continued down the hill and entered Fort Mason Chapel, a small, rustic wooden building. 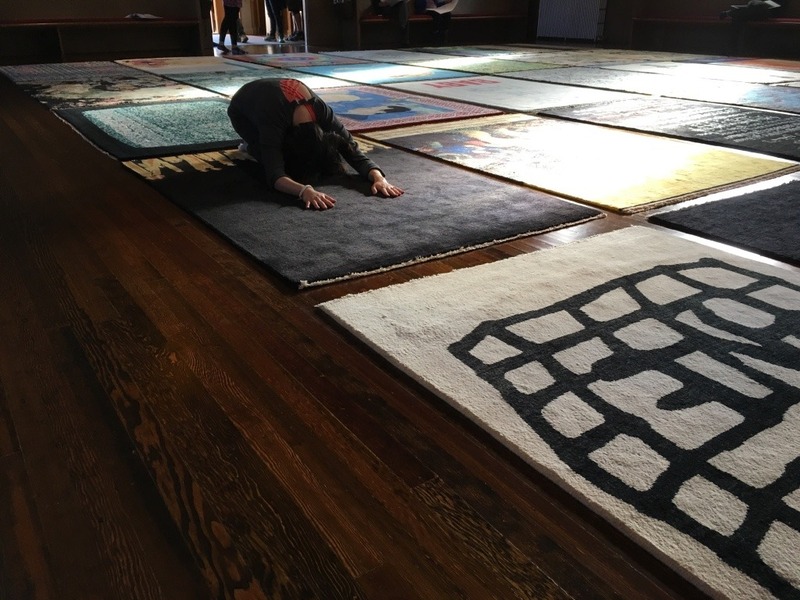 We removed our shoes and stepped in to a room of prayer rugs illuminated by the afternoon light. Each rug represented an artist’s interpretation of the word “sanctuary”. We allowed our hands and toes to explore the threads and messages of each carefully woven rug. We stood in silence, inspiration, and respect for all those seeking sanctuary. Two very different places yet the light that shown through the images wove us together. We felt awe, wonder, inspiration, and gratitude for this powerful day. This walk emerged from my desire to help people see their landscape with fresh eyes. It was an invitation to be pilgrims in in own communities. I did not expect that by walking into light, wonder and awe that we would weave such deep heartfelt connections. Where in your community could you take a walk with a group to experience your landscape with fresh eyes? What textures, images and metaphors could bring you together? In these times we often notice divisions in our society. It was refreshing to be brought together by the threads of the landscape, quilts and rugs. We left energized, rejuvenated and awakened by our common hearts, smiles, tears and experience.